That breakout on your chin is different from the zit in the middle of your forehead, and those blackheads on your nose are different from the deep pimples you get on your cheeks before your period. Oh, and don’t forget about those zits you get on your hairline or on your upper back. 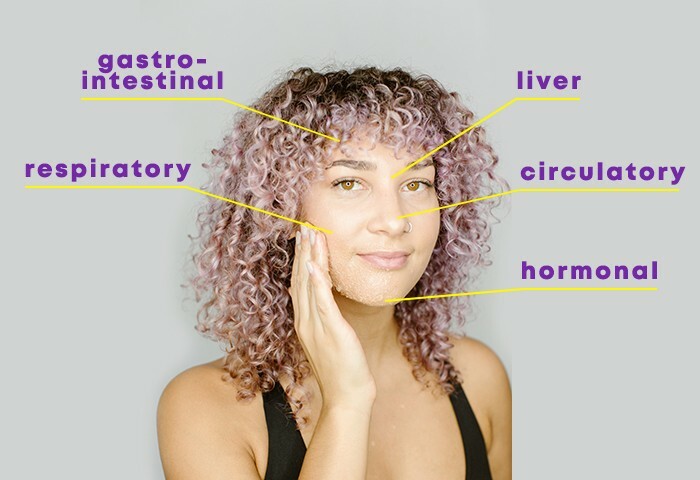 According to an ancient Ayurvedic technique called face mapping, the location of your acne is related to what is going on inside of your body. It’s an ecosystem! Have you ever noticed that more zits seem to appear around your chin and jawline shortly before your period? According to leading dermatologists, breakouts in this area are often attributed to hormonal imbalances. Amanda Doyle, MD, a dermatologist at the Russak Dermatology Clinic in New York City, says that hormonal acne is caused by an excess of the male hormone androgen. Androgens, which include testosterone, can overstimulate your oil glands and lead to clogged pores and bacteria growth. Dr. Doyle recommends prescription-strength products to treat hormonal flare-ups that occur fairly regularly. However, my favorite way to prevent pre-period pimples is with a consistent skincare routine formulated for your individual skin needs. Paula’s Choice Routine Finder helped me create the perfect skincare regimen. Specifically, daily use of the serum niacinamide from Paula’s Choice has greatly reduced my hormonal flare-ups! According to healthline.com, acne around your hairline is often due to product buildup from your hair or beauty products. To prevent breakouts from happening here, try keeping your hair out of your face, especially at night. I sleep in this Grace Eleyae Satin Lined Cap at night to keep my hair out of my face and to prevent breakage — win-win! If acne persists in these spots, you may want to try swapping out oil-based products for oil-free ones. Have you been a little heavy on the cheese or alcohol lately? Pimples found on your forehead are often associated with your digestive system. Forehead acne could indicate that your body is having a hard time digesting certain foods, and studies have found that alcohol and dairy specifically can lead to increased skin congestion. There is evidence that dairy, alcohol, and fatty foods that spike your blood sugar quickly can potentially exacerbate acne. Healthline also suggests breakouts here could be a cause of stress, lack of sleep, or liver problems. Sleeping on silk/satin pillowcases has helped me prevent cheek acne, I got mine from Grace Eleyae. I tend to get pimples on my back in the summer, which tells me my back does not like this Texas heat. Sweat trapped under your clothing (especially if tight) can be one of many reasons you are getting bacne. Similar to pimples near your hairline, hair and beauty products are also a top cause of back-related zits. Make sure you are keeping your hair off your back if you use oil-based hair products and cleansing your back daily to get rid of any excess sebum from sunscreen or hair product residue. I like using an all-natural body scrub like Otavea to clean and exfoliate my back after a hot day in the sun! My biggest tips for keeping my skin as clear as possible are adequate sleep, a healthy diet and a consistent skin care routine. I still get the occasional breakouts, but generally it’s because I stray from my own tips and indulge in too much sugar! How do you treat acne or occasional zits on your face and body? Share your secrets and tips below! And if you’ve heard about biotin causing acne and want more info, check out this article.